A designer’s dream and a builder’s vision seem to have recently coalesced rather nicely to create the Agile 42, a brand new high-performance, all-carbon luxury cruiser from the Netherlands. Built by VMG Yachtbuilders and launched in September 2017 the Agile 42 (Karma) has been designed for discerning yachties who want to combine speed and comfort. The Agile 42 is built entirely of carbon fibre to create a lightweight yacht. However this yacht is equipped with a full on interior with enough space and all the necessities as well as a large cockpit to make for comfortable but very fast cruising. This Agile yacht is characterised by its ultra modern design based on the latest insights in naval architecture. 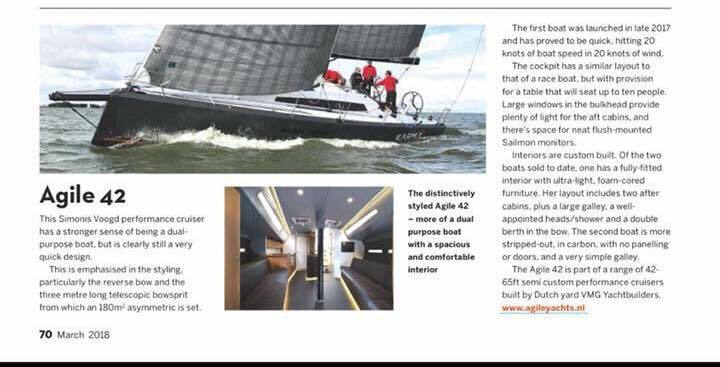 The yacht ticks all the boxes for the modern allround sailor who is not prepared to compromise when it comes to looks, comfort and performance. For weight saving and quiet propulsion she has Lithium-ion Super B batteries, 8kW at 48V DC, powering a 10kW Oceanvolt electric motor that has regeneration capabilities.